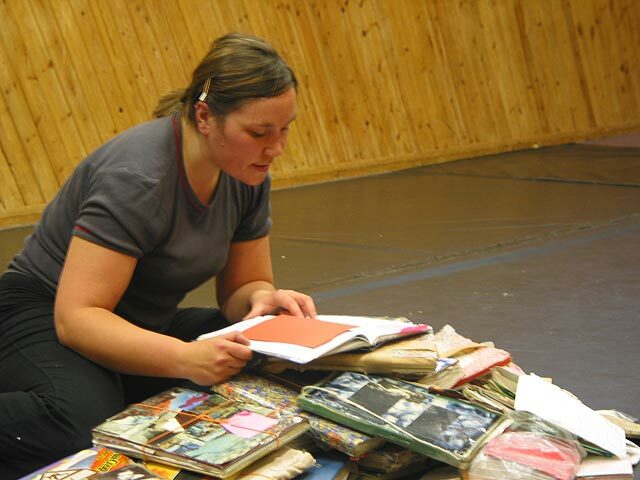 Tamsin Williams performing Work In Progress at the Brighton Slipper Baths, 2003. Photograph: Nick Sayers. This one-woman piece was performed at Fabrica art gallery and is currently in development. I examine a personal history through my collection of diaries dating back to 1987. These diaries range in size and weight, and are filled with images, poems, clippings, letters etc. I play with metaphors created from the sheer weight and number of diaries, the irony that surrounds making art, the language and processes involved and what it means to live truthfully as an artist. 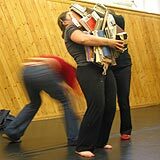 The piece is poetic and includes reading, singing, balancing, dancing, carrying, and sometimes interaction with the audience! It is a moving celebration of our uniqueness as individuals, our relationships and what affects our daily lives. As I walked back up the lane after leaving Captain in Murphy’s field I had a strange sensation that I thought a dog should run up and lick my hand. I felt lonely without a single dog, for the first time I missed Judy, her pace and her affection. And then I thought about Ringlet getting run over. It was as if in a flash my Stainton Gap had returned to me in remembering the dogs, that I was never really alone and despite their tendency to run off and the constant bore of feeding them when I got in from school, I had loved them all dearly, especially my two. You couldn’t sit down without one of them bothering you and then the awful dilemma of who to take on a ride and always having to leave some behind. I thought I could hear the pat of Ringlets paws behind me, but she had gone. Cats are poor replacements, they’re not your friend no matter what. They just lie on your bed and eat your food. It’s strange to be here without a dog. Can’t resist playing Now13 all the time I really am addicted to it! ‘A groovy kind of love’ really reminds me of when I danced with Johnny Clinch. Yes, still thinking about him. I really would love to go with him at Buffers. Trouble is I may not be able to get in, and if I do Johnny may go with someone else, and I’d just die! Based on the performance above, about a young woman preoccupied with retrieving journals from various places around her house. Another character reveals a darker side to the story with a destructive dance. Some diary entries are spoken aloud, as if she is reliving these moments whilst retrieving each journal from it’s hidden place. The floor becomes tiled with personal memories, each book an individual, covered with images and over-spilling with clippings. In the final shot she is seen weighed down by her books staggering along the street. Directed by Tamsin Williams. Performed by Jade Blue and Jen Sanders. Edited and Produced at The Place, London on a short Dance on Screen course led by fimmaker Miranda Pennell. The browser you are using does not support the layout used on this site, although you will still be able to read the content. For more information, please visit the Web Standards Project.